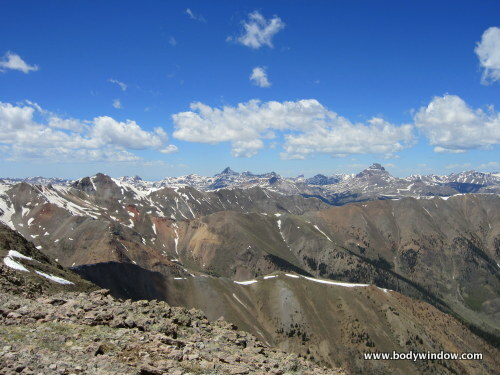 This is our trip report of Point 13811, our 96th Centennial Peak Climb in the Colorado mountains near Lake City. It was a lovely day in early June. "Mountain climbing makes you very humble because you see how teeny tiny you really are in the Universe." 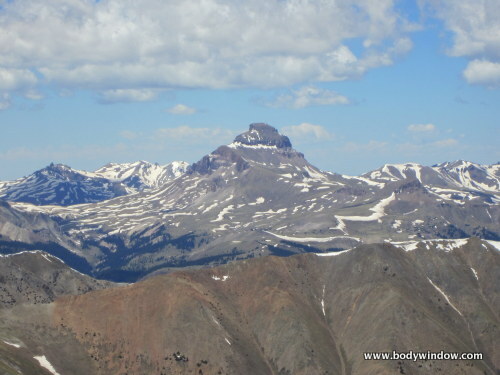 The Centennials are the top 100 ranked peaks in the state of Colorado and include all peaks over 13,800 feet, including the very popular "fourteeners" (those above 14,000 feet). 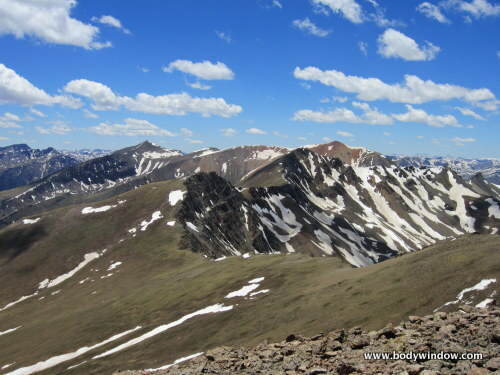 All the fourteeners are usually very crowded on the weekends, with the weekend warriors racing one another to the summit. The "thirteeners," much less popular, can often be climbed without seeing another individual. Such was the case for our climb up Point 13811. It was a lovely time, with the peak all to ourselves. 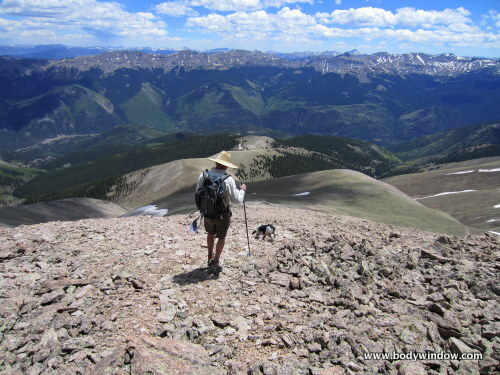 We chose the Williams Creek Trail near Lake City, CO to approach this peak. It is not a well-traveled path, as most folks choose to climb Point 13811 together with Point 13,832 from the Grizzly Gulch Trailhead. This is the most expedient way to climb them, but we had no need to add Point 13,832 to our day because we had done it some years ago. We had used the Grizzly Gulch approach then, which also accesses the popular fourteeners, Sunshine and Redcloud, because our goal had been both peaks. However, we were stormed off the mountain before we reached Point 13811. Such is the case with many a mountain climbing expedition. Both of these points are technically un-named, but we noted at the summit, that Point 13811 is know among the locals as "Munchie Mountain." I never did learn from where this name came. The Williams Creek Trailhead can be found on County Road 30, less than a mile south of Lake City. Turn south, from route 149 at the Lake San Cristobal turn off, onto CR 30. Travel 6.7 miles south on this road until you see the Williams Creek Trailhead on your right. It is hard to miss. Here I am, getting ready for the long climb. 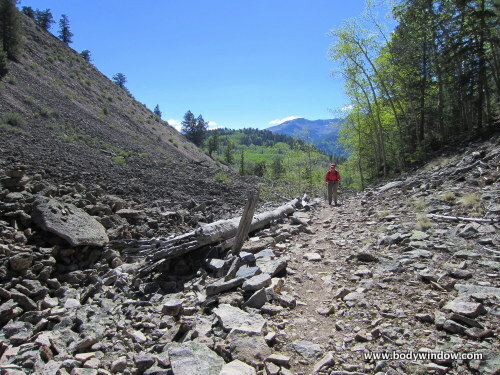 As you can see, this trail, even in early June was hot and dry, due to the southern slope exposure. Make sure you carry plenty of water and try to get an alpine start to avoid the heat. 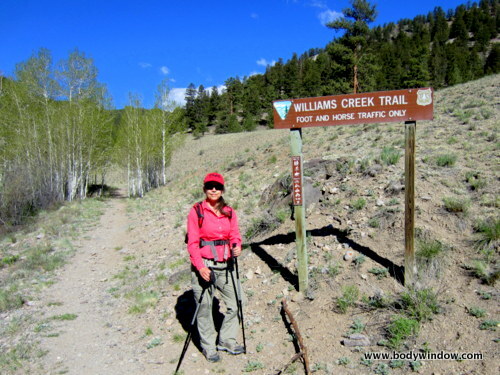 Begin the climb at the trailhead by walking west, with Williams Creek on your left. The Williams Creek Trail soon crosses a meadow (photo, below, left), where at the far end you can sign into the register (not pictured). At about 1/2 mile (my GPS said 0.46), cross a small tributary creek. 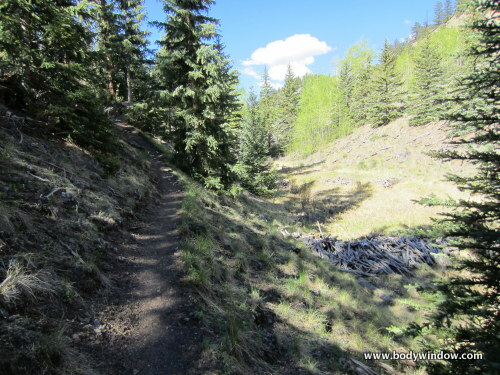 At 0.76 miles, cross the Williams Creek (above right), where you leave it for the remainder of the climb. 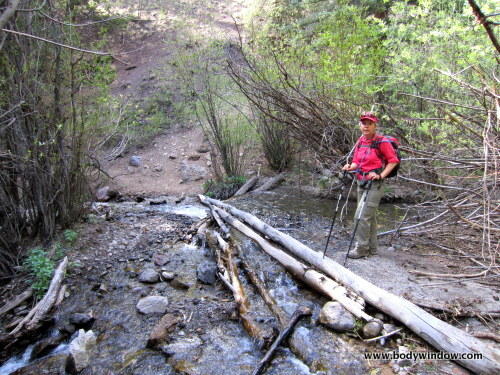 From the creek, you head more southwest as you begin to climb steeply along another dry drainage. 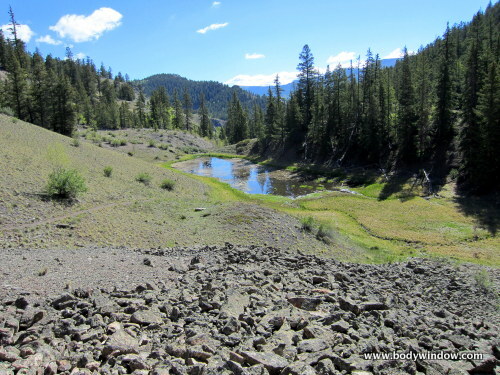 As you climb out of the Williams Creek drainage, you will encounter several beaver ponds along the way for the next mile. Many of them are dried up. Judging by the rest of the trail, this area has been dry for some time. 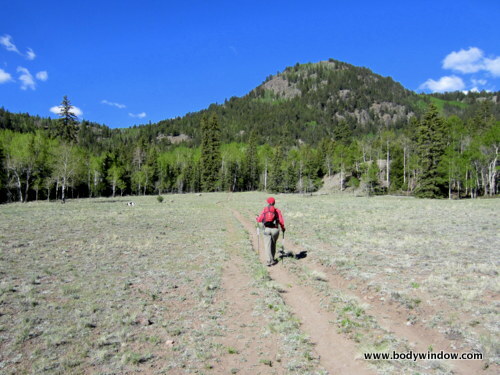 In addition to the beaver ponds, you know you are on the right trail because it crosses several moraines adjacent to the beaver ponds. 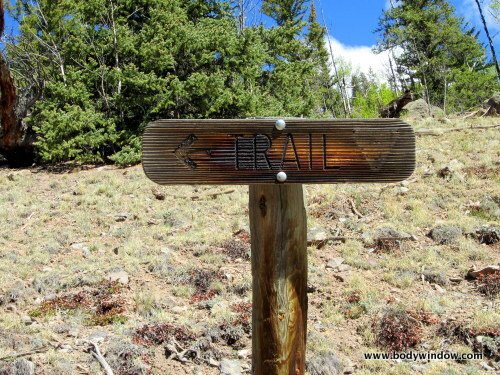 It was most helpful to encounter signs along the way, such as these, marking the trail. 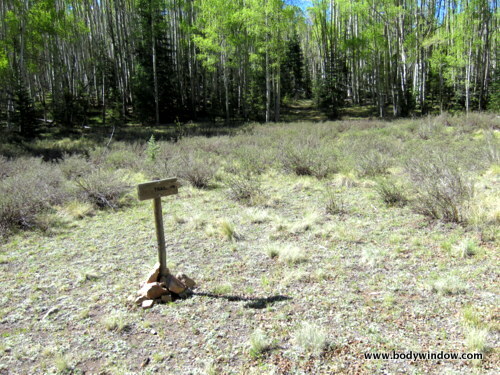 At 1.7 miles, we encountered another trail sign in a meadow, where the Williams Creek Trail joins a faint jeep road. My GPS said we were at 10,000 feet. 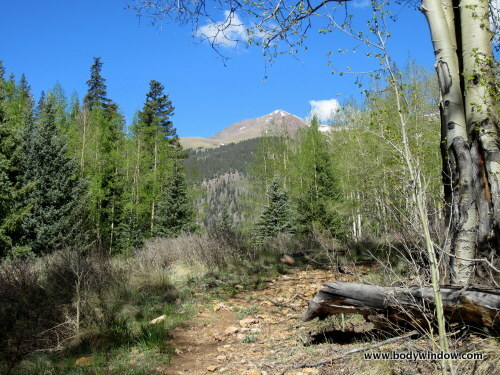 Turn right here onto the jeep road, and climb steeply through the aspen trees until you reach a very distinct moraine. Follow this moraine to more meadows, where you can catch your first glimpse of Point 13, 811. 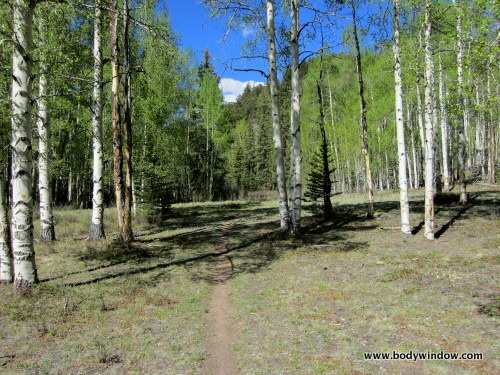 The aspen trees here are gorgeous and your climb alternates between thick aspens and open meadows. The trail switchbacks and eventually turns northward. 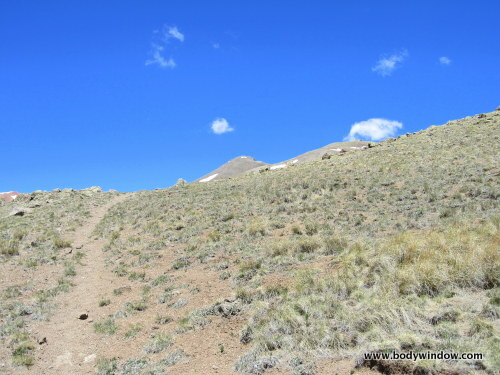 When you reach about 11,200 feet, there is a final idyllic meadow (waterless) where the jeep trail turns and heads steeply up, more towards a westerly direction again. 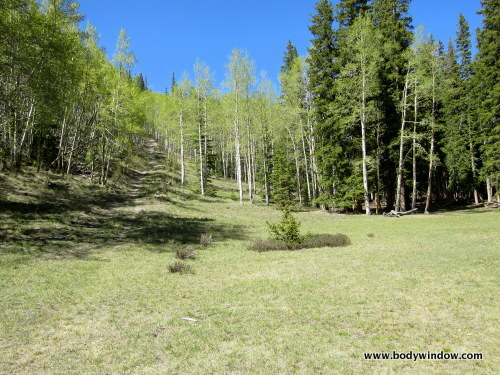 The aspens make way to pines as the terrain gets steeper and drier. At about 11,900 feet, the trees dwindle and the views begin to open as the trail climbs steeply to the point at 12,195 feet. You have traveled about 4.2 miles thus far. 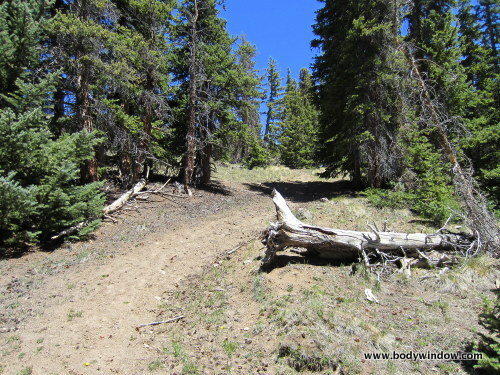 The jeep road ends here as you go around the point, and the trail travels north to Peak 13811. Your destination is in clear view, across the tundra. 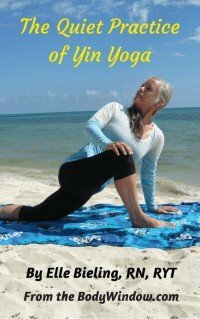 Study your approach from here. You still have about 2.2 miles and 1600 feet to go! Point 12,195 is on the right side, here in this picture. Follow the faint trail as it continues high on the shoulder to point 12,483, just above the small clump of trees on the middle right side of the picture. From this high point at 12,483, you can see the Williams Creek Trail continue on to the northeast below the summit. This is NOT your route. 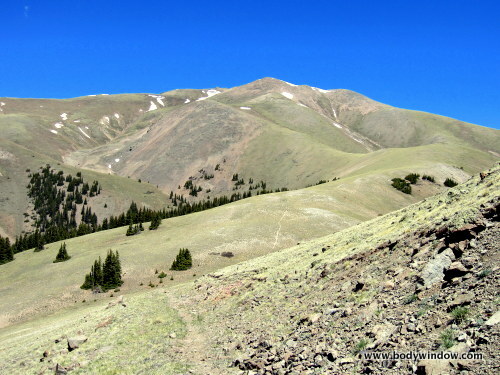 The trail takes you to the saddle between Grassy Peak and Point 13,811. It does not take you to the summit and will lead you way away from it. Fortunately we did not make this mistake! Instead, head up to the next visible high point in this picture, to the northwest. There are very faint foot paths from use only, that you will see along the way. In the picture above, take the high point to the left of my head. 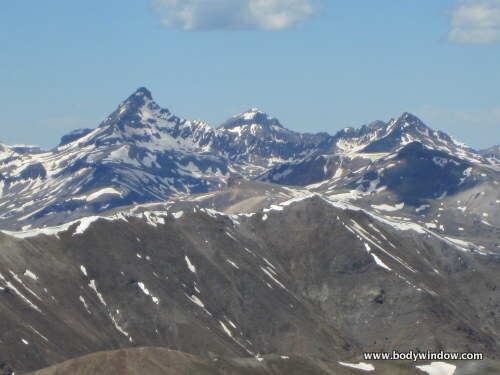 Walk along the skyline towards the horizontal snow field and up to the peak, along the skyline. 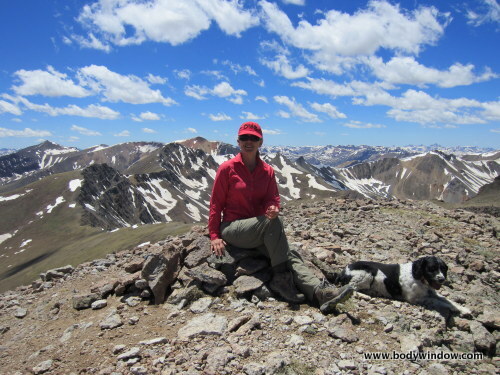 When you reach this high point (to the left of my head), just above 13,000 feet, all you have to do is head due north to the summit! While we did not take this exact route, but instead climbed up the drainage from the trail, (Just below and to the right of the horizontal snow field in the picture), the easier way could be easily seen on the way down. Plus all the foot prints and goat trails were a dead giveaway. It is always easier to see the route on the way down. 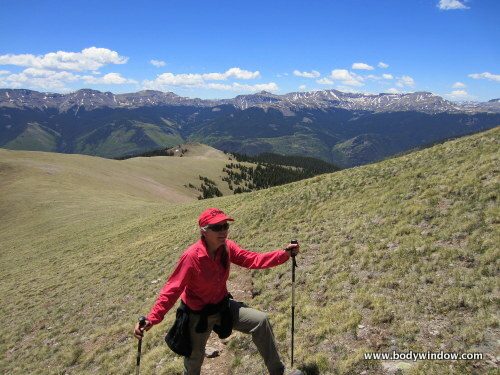 The Climb above Point 12,483 ~ Views Abound! 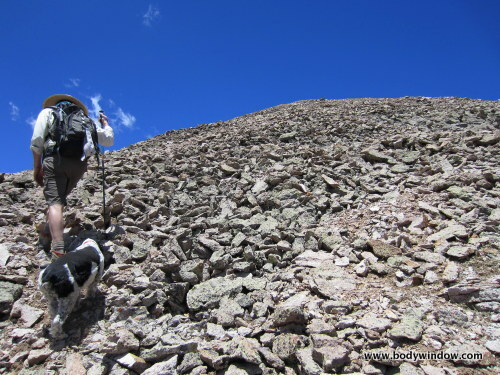 Here is my husband, Rich, and my dog, Avie, just below the summit, in the talus (loose rock), making the final push to the summit. After the long, long approach, our legs were really burning! There is no trail here, so you just have to pick your way through the rocks. The summit at last! In the picture below, you can see Mt. Sneffels, the prominent peak to the right of Rich's head. Here I am on the summit, below. Yeah! 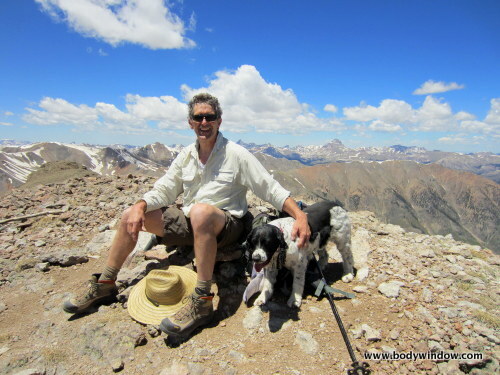 Redcloud Peak, a fourteener is just to the left of my head. Point 13,832 is just to the foreground of Redcloud. You can see the long traverse from where I am sitting, on the ridge, to Point 13,832. And yes, you could actually keep on going to Redcloud, but it would be a lengthy day if you came back through the Williams Creek Trail! All total, my GPS said that one way was 6.44 miles. About a half mile more than Gerry Roach's book says. Round trip just shy of 13 miles. With a beginning elevation of 9,185 to 13811 for a vertical gain of almost 4700 feet, this made for a very long day. It is not a difficult climb technically. 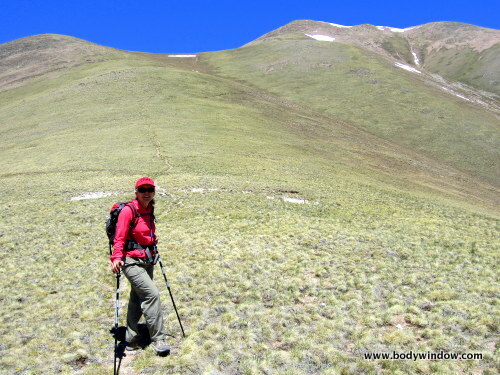 It is rated a class 2 walk-up, but the length and altitude gain will test your legs! We did it in six-and-a-half hours, with plenty of breaks and a long stop on the top. If you were to add Point 13,832 to the trip, it would make for a long and arduous day. I was glad we had already summited that peak! We hung out on the summit for almost an hour! The views were fantastic. Reluctantly, we headed back down. 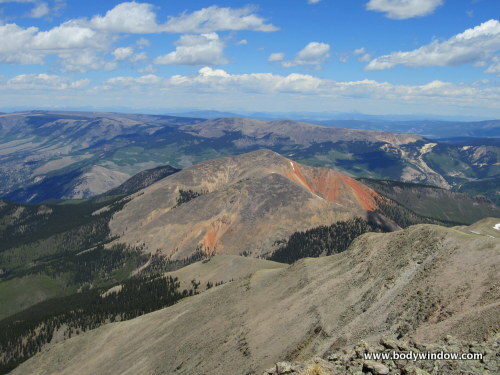 The trip down is also very rewarding and we take in views that we didn't see going up! All-in-all we had a perfect mountain climbing day. No afternoon storms at all, and that was good since we got a late start. If you are interested in more climbs of the thirteeners, I recommend Gerry Roach's book, Colorado's Thirteeners. It has been our bible for the last many years! 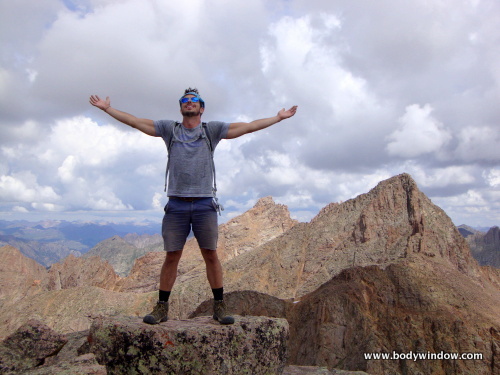 Nothing heals my body-mind-soul like a day in the Great Outdoors and mountain climbing Point 13811 was no exception!